It rained again today here in the real life version of Zappa's The Torture Never Stops. The torturous part of this kind of weather is the "pop up" part of popup thunder storms. It goes like this: the ski - ooops - sky turns blue and begins to clear, and just when you have your bike tires pumped up and bike shorts on, the torrential rain and lightning starts. I challenged Mother Nature the other day however, and won. I don't get a chance to say that very often, but this time it was a matter of the odds. I fearlessly went for a bike ride when the forecast leaned heavily on the side of heavy rain, but it didn't. I usually end up drenched, so I was due. Have no drought worries though, the sky opened up just as I arrived home. To say it has been a very verdant Summer is being kind. 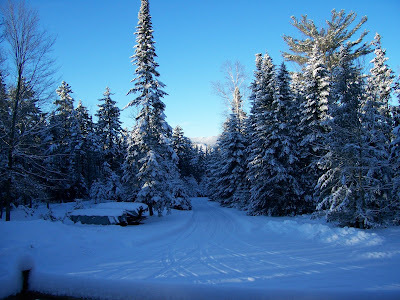 When the current variety of Adirondack weather strikes, I like to look through the photos of my favorite Adirondack weather, like today's view from home.